I really like Peter Brown’s book, My Teacher Is a Monster and one night in the early hours I woke up and was mulling over how could I come up with an activity that would go along with the book. All of a sudden I thought “What is the opposite of a monster teacher?” Answer: a perfect teacher! I wanted to combine several concepts: the IB’s Approaches to Learning-Social Skills (formerly known as Transdisciplinary Skills), IB-PYP Profiles, writing practice and art work. I read the book to the classes and it was very popular with the third grade students. Some students noticed that the teacher gradually changed from a monster to a more human form. This gave us the opportunity to make a connection with a IB concept-perspective. They decided that she didn’t really physically change, but Robert’s view of her did change. 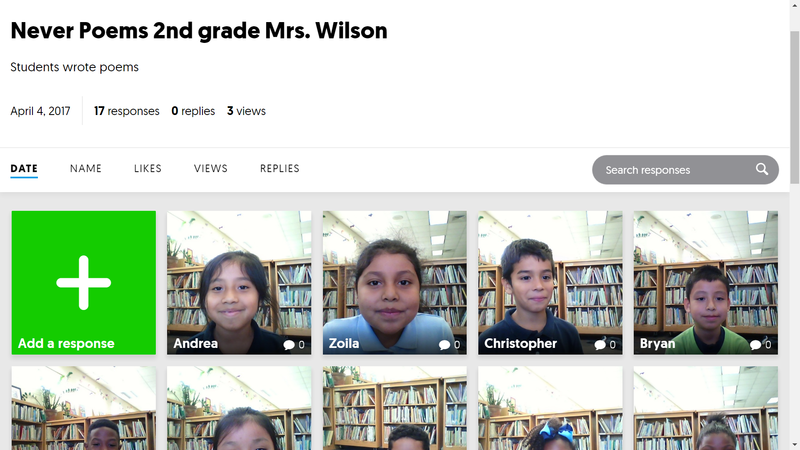 I told the students that they would work in groups to create a “perfect” teacher. I created a graphic organizer which combined the IB-PYP Profiles and Attitudes, adjectives, verbs and activities. Each student received a copy of the graphic organizer and were instructed to brainstorm independently. I also placed thesauri on the tables and reminded them that if they needed a more interesting word they could find a synonym in these books. This is as far as we got the first week. I downloaded a PYP Transdisciplinary Skills Toolkit from Mary’s Store on Teachers Pay Teachers (free) as it had each group of skills contained on one page with student-friendly font and text. I made copies of the Social Skills and laminated them. The second week we started by reading the Social Skills of the IB’s Approaches to Learning. I filled up my tables (which seat six) and each student had a copy of the Social Skills in front of them. They did a round robin reading of the skills and had an opportunity to discuss and ask questions. I divided each class into small groups of three groups, adjusting for personality conflicts or behavior. After reading the Social Skills I moved the students so they were seated with their group and they began comparing the attributes of a perfect teacher. 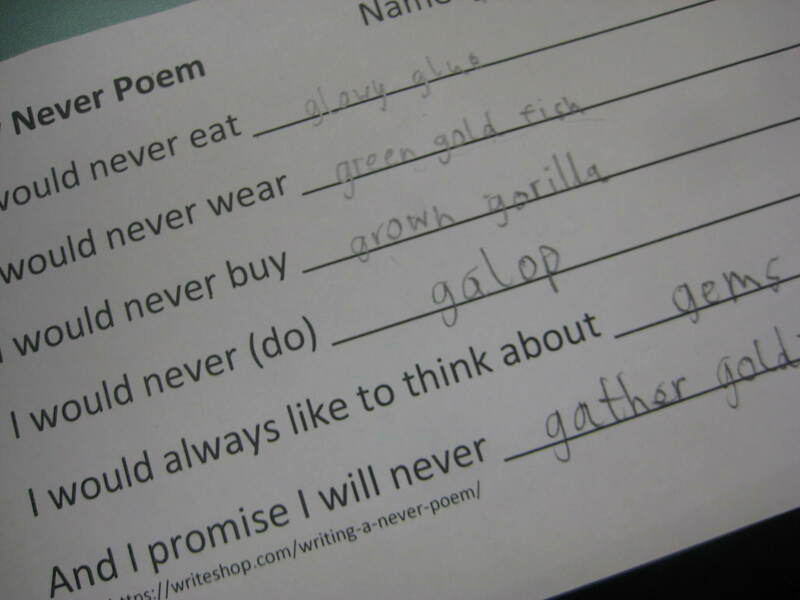 This gave them the opportunity to practice those Social Skills! In week three the students finally got to what they called “fun.” I gave each group a length (about 36″) of white butcher paper and a container of crayons. I drew a head, two hands and two feet on each sheet to give them a starting point for their drawing. They were reminded of the Social Skills that were reviewed the week before to encourage a positive group experience. I told them that all of the words on their graphic organizer had to appear on their creation. Several students said after this session that it was so “fun.” Judging by the conversation and energy in the room, it was a positive beginning. I gave the students about 20-25 more minutes on their fourth visit to complete their drawings. They were having such a good time and for the most part working well in groups. I enjoy reading Jacqueline Davies’ Tricking the Tallyman: The Great Census Shenanigans of 1790 to 3rd grade students. It’s illustrated by S.D. Schindler. Hey, how often do you get to use words like shenanigans, scoundrel and phrases like “cheese and chowder”? Our 3rd graders have a unit on government and its functions, so it’s a fun way to dive into those ideas. c. State an example of the responsibilities of each level and branch of government. This is how we tie in the book, because it covers the census, taxes, representation, government services, and conscription. By this time in the school year, we have already used a dictionary, thesaurus, an atlas and an encyclopedia (both print and online), so I decided we would practice again. There are some unfamiliar words and concepts in Davies’ book, so I thought we would become more familiar with them before we read the book. I divided them up amongst the different reference tools. They looked up tricky words in the dictionary and thesaurus (tally, census, scoundrel, heartsick, shenanigans, conscription, tax, etc). For the atlas activity the students found Montpelier, Vermont (Tunbridge is so small that it wasn’t in our road atlases) and noted what they could learn from looking at the map. 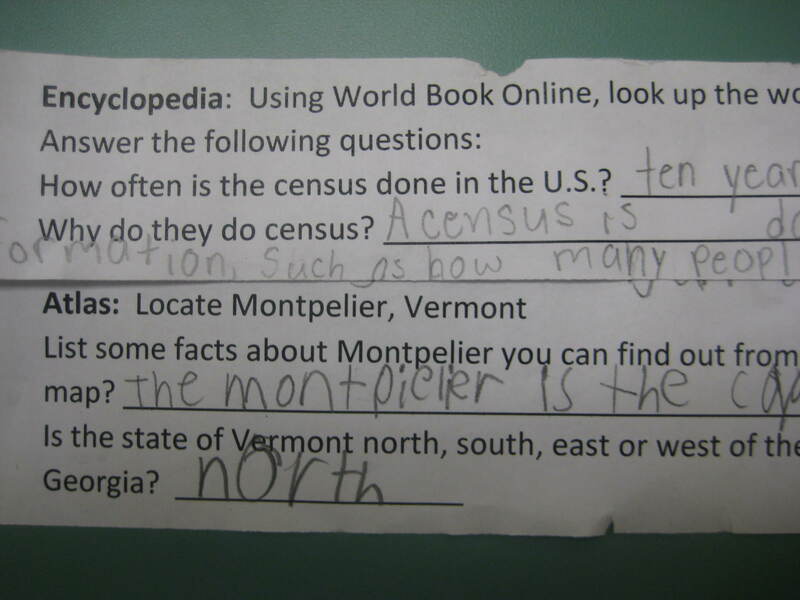 Using our online World Book Encyclopedia, the students answered questions about the census. 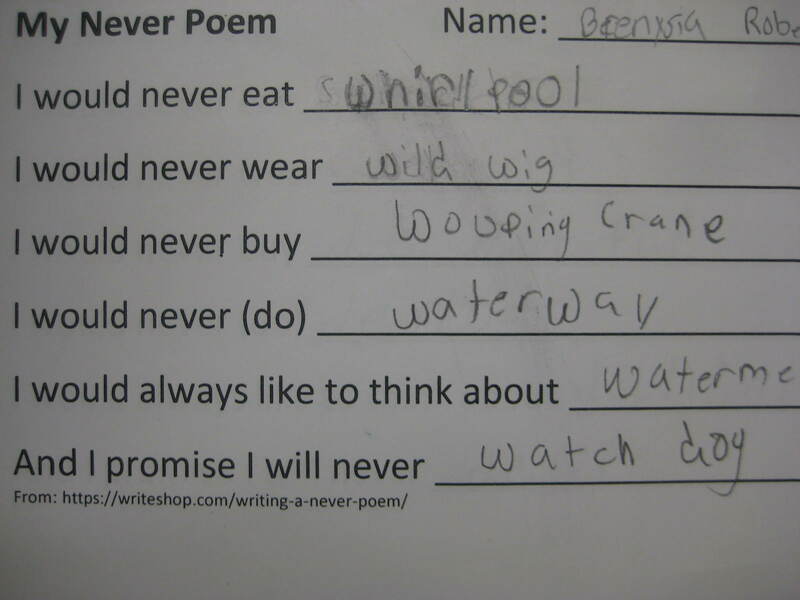 The following visit we shared what we learned and then we read the book. I think the students understood the book more fully having familiarity with the new words and concepts. I have been teaching our 3rd grade students about reference tools, using props of real tools (hammer, screw driver, saw, pliers) to reinforce the concept of tools. After a week’s break when we celebrated Dot Day, I’m resuming reference tools. So, to get us back on track I read the book, Boris Ate a Thesaurus by Neil Steven Klayman (illustrated by Barry Chung, Super Senses Production, 2014). Boris eats a thesaurus and as a result he starts speaking in synonyms! It was good review of what synonyms are and that the “tool” you use to find them is the thesaurus. Fun text with bright illustrations. Several students made a connection with another book I always manage to read to several classes each year. The story reminded them of Oliver Jeffers’ The Incredible Book Eating Boy. Next week we move onto atlases. A repeat activity and instruction from last year, but it was so successful it was worth a repeat. I give the students a word to look up in a traditional thesaurus and ask them to write down three synonyms on their “synonym roll.” I bookmark an online thesaurus and ask them to add to their list. 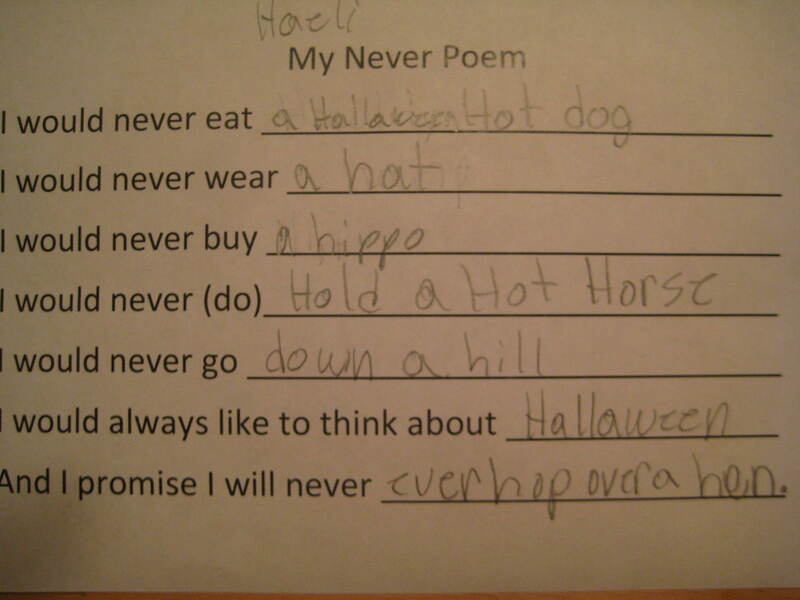 They cut out their rolls after they have written down plenty of synonyms. I did add one twist this year. 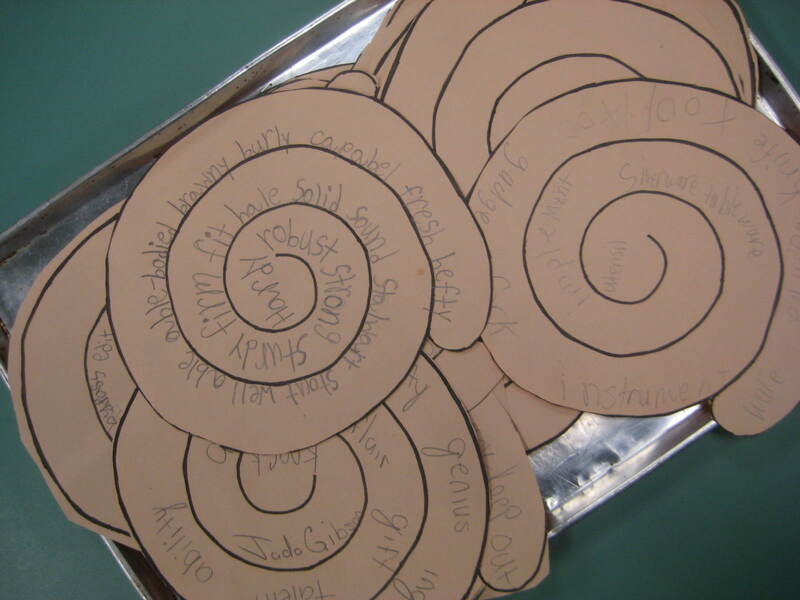 After the students filled in their synonym roll with synonyms, the placed their cut out roll on a baking sheet! They got a kick out of that. It was just a place for them to drop their rolls as they moved on to checking out their books. They all finished at different times and they usually ask over and over, “What do I do with…?” even after clear instructions, but this time they all rmembered to place their roll on the cookie sheet! 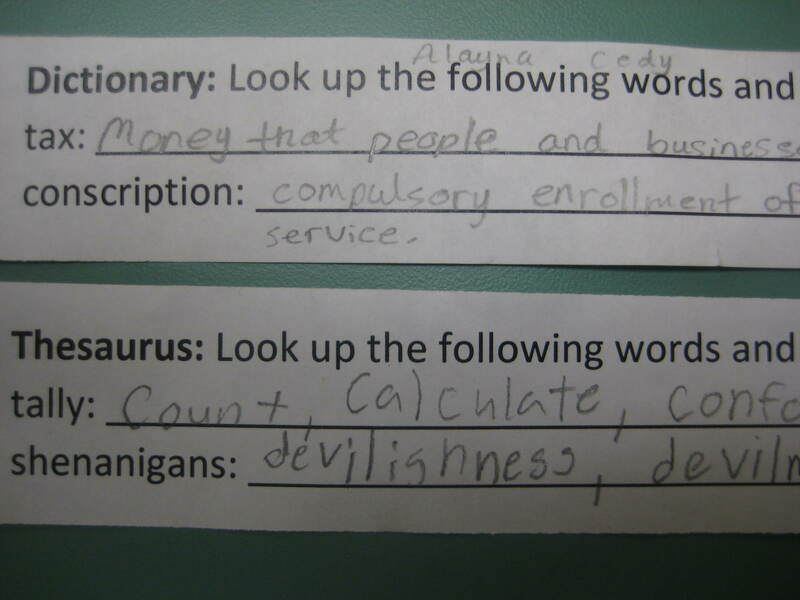 Students used an online thesaurus after starting out with the traditional version. Used either Merriam Webster or Thesaurus.Com. We collected the rolls as students finished on a baking sheet. 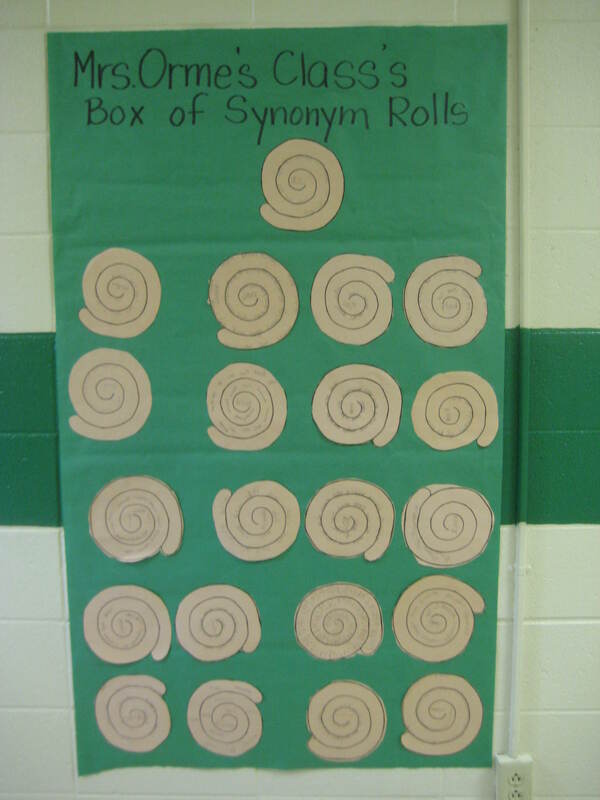 Synonym Rolls displayed in the hallway.